We’ve partnered with Mirum to promote Knorr® Selects Bouillon, available at Walmart. 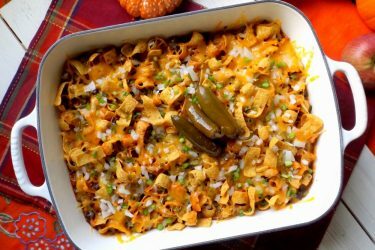 You've probably heard about chilaquiles, but if you've never made them at home you've been missing out. This breakfast is made with homemade corn tortilla chips tossed in warm salsa, topped with crumbled, queso fresco and eggs. 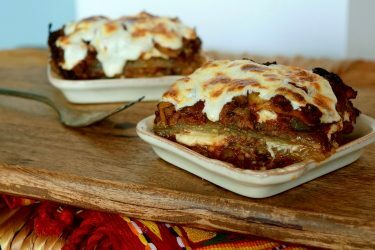 Simple enough to be such a delicious and popular Mexican dish. 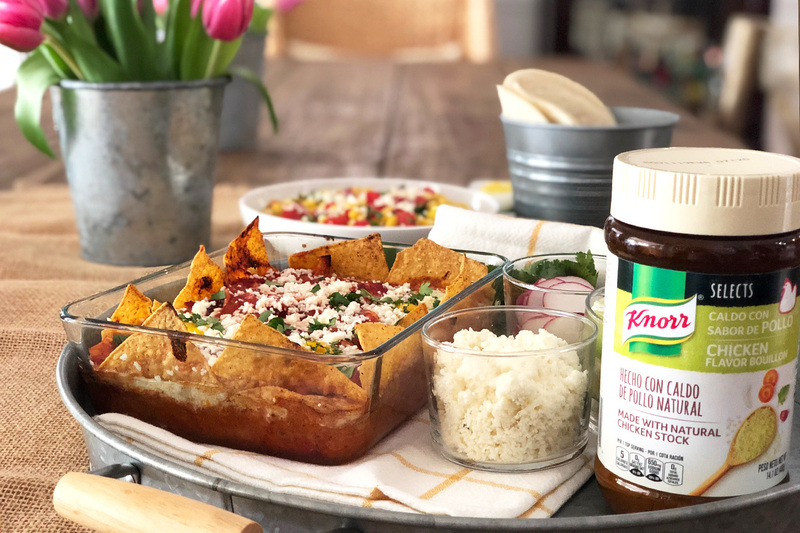 This time we're taking our basic chilaquiles and giving it a boost of delicious rich flavor by using Knorr® Selects Granulated Chicken Flavor Bouillon, made with natural chicken stock, enhancing the authentic taste of this recipe. Knorr® Selects Granulated Chicken Flavor Bouillon has no added artificial flavors, no colors from artificial sources and no artificial preservatives. Perfect for every recipe, this traditional ingredient in Hispanic food sounds too good to be true, right? If you are wondering where you can find it, you don't have to look too far, just go to the Hispanic Foods aisle where you already love to shop, Walmart! 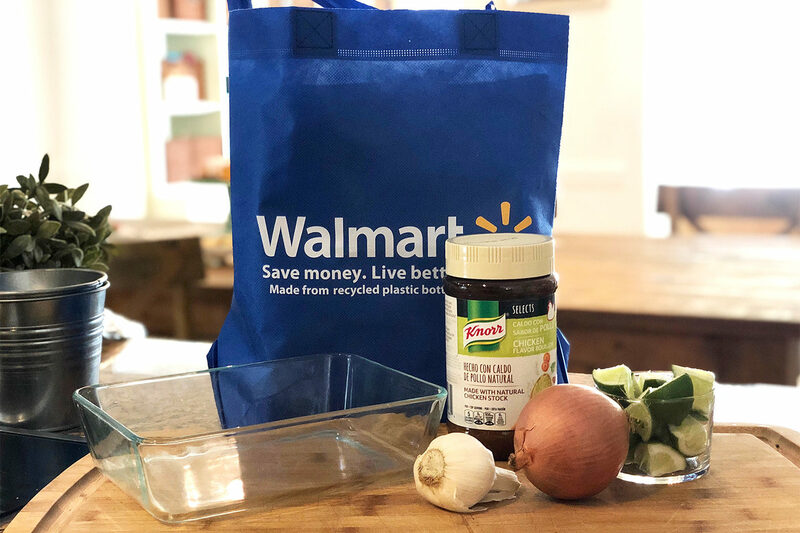 Find it in-store or take advantage of Walmart's Online Grocery Pick Up or order online from Walmart.com and get your Knorr Selects Granulated Chicken Flavor Bouillon without even having to get out of your car. 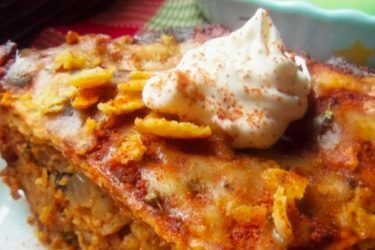 You can easily substitute the ingredients in this Chilaquiles Breakfast Casserole with your favorites: shredded chicken breast, roast beef, onion rings, crema, sprinkled cheese, fried eggs, chorizo, and even lettuce leaves. As long as you include Knorr Selects Granulated Chicken Flavor Bouillon you will always have flavorful chilaquiles any day. We suggest you have it for breakfast but it's so good we won't blame you if you want to have it for lunch and dinner too. Preheat oven to 350°F. Spread your quartered tortillas evenly on a baking sheet and bake for 15 minutes. Remove; let cool. In a large skillet heat your vegetable oil over medium-high. Add onion and garlic. Cook and stir 2 minutes. Add tomatoes, Knorr® Selects Granulated Chicken Flavor Bouillon broth, and chipotle peppers to your skillet. Bring to boil and reduce heat. Simmer your mix of ingredients uncovered for 10 minutes, stir in occasionally to mix the flavors. Add your cooked chicken. Grease your baking dish and cover the bottom with the baked tortillas quarts. Top with your chicken mixture and let it cool for 10 minutes. Preheat oven to 350°F. Cover the casserole and bake for 35 minutes. Remove from the oven. Make 4 indents in with the back of a spoon, in your mixture. These is where the eggs are going to go. Crack each egg into their respective indent. You can also crack each egg into a small mixing bowl to slip the egg into their indents. Repeat with all the eggs. Sprinkle with black pepper. Bake uncovered for 15 minutes or until the whites and yolks are thickened or cooked to taste. Remove from the oven and let stand 10 minutes. Serve with cheese, cilantro, avocado or your favorite toppings.